Windsor Marquees offers the highest standards in marquee hire in the Stroud area, priding ourselves on personal service, care and attention to detail. We aim to make your event a perfect and successful event. We specialise in marquees and accessories hiring and our dedicated staff are here to ensure you can relax and enjoy your day, whatever the occasion within Stroud and its surroundings. The Cotswolds is well renowned for being a beautiful and natural area, based in the depths of the Cotswolds. The Stroud area situated in and amongst valleys, hills and dramatic and stunning scenery. This lush landscape, together with a unique and unspoilt heritage, perfectly presented villages and quaint market towns make this area a pleasure to live in and visit. Two things that you probably didn’t know about Stroud is that the lawnmower was invented and originally demonstrated here by Edwin Budding in 1830 and the now famous television event, Cider with Rosie, was set in and around Stroud and the Cotswolds. 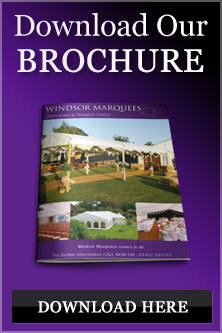 Windsor Marquees have been hiring marquees in Stroud for around ten years, serving businesses, leisure facilities, accommodation and entertainment venues with a wide range of marquee and canopy hire. We have successfully hired marquees for local weddings and many types of functions, with marquee hire in Stroud something we are proud to be associated with.